My step daughter (SD) is 11 years old. I have been in a relationship with her father for 9 years (married the last 5). She was a cute little toddler who still used a pacifier when I met her. She is now a beautiful young girl who is gentle, social, and cares greatly about others. Being a significant person in her life has not always been easy. I was ambivalent about wanting children (I now have 2 of my own) and very weary of someone else’s child being in my life. I would characterize the first 3-4 years (mainly the ‘dating’ years) as being the recipients (me mostly, but also my husband) of passive-aggressive behavior from biomom. It was not pretty and it didn’t bother me the first year…but you can only endure so much before you start to see it for what it is meant to achieve- an assault on you personally – due to her fear of your power, or what she thinks you represent in her and her child’s life. Maybe it was truly anger that her marriage dissolved and her spouse moved on. Whatever she needed to work through, being passive aggressive was her means. My poor husband was caught in the middle. Not very fun sometimes. Once my husband’s ex-wife got remarried, it was much easier to communicate and attend events for our 11 year old. She had her ‘team’ and did not need to be sheltered by the other moms, who also cast looks my way and never said hello to me at after school pick-up. But that’s just the way biomom and her posse rolled. And I got pretty good at letting it roll right off my back. Although tensions had eased over the years, biomom and her husband did their things with SD and we did ours. But as elementary school came to an end and middle school was on the horizon, SD was showing signs of anxiety, sleeplessness, and fear at her mom’s house. This led to having to get Dad involved and my husband saw an opportunity. He set up the conversation as a 4-way meeting: biodad & stepmom with biomom & stepdad. All by speakerphone. SMART! This resulted in a 4 hour phone conversation in July to hash through SD’s anxiety, sleep therapy, middle school schedule, activities etc… It was good. It was open communication where we could all speak TOGETHER for the benefit of one young girl who has spent years trying to figure out how to navigate two houses and two families. And you know what…my husband was right, it was about time the adults started to communicate with one another. No more ‘middle man’ and playing ‘telephone’. Be direct. Have permission to speak with one another, it’s OK.
We had officially established our co-parenting efforts that now openly included all four parents. As a result: It opened communication with my stepdaughter. For the past 5 years, we have also lived in different school districts. SD’s school was going the opposite direction during the morning commute and we only have one car. We made it work for 5 years but middle school had a different start and end time and no after school child care. By having this conversation among the parents, and it gave her permission to let the adults worry about the adult things. What if drama club fell on a “dad” day and what if dad couldn’t pick her up? We told SD that she should join the activities that interested her…period! And the adults would figure out the rest. It gave SD permission to tell her mom about me and vice versa. Prior to this, she didn’t even mention to her mom that I was pregnant with baby #2. She assumed we told her mom and we assumed she did. Her mom finally bridged the topic with my husband when it was pretty obvious I was pregnant. But how would an 11 yr old know that it’s OK to talk about her stepmom with her biomom unless we told her “it’s OK”? Ultimately, we set the rules as parents and adults. We can not assume a child can navigate these relationships. Now, our 11 year old talks to us more! In fact she can be a down right chatter box. We work as a team with her mom to get her to the events she needs to be at. I feel comfortable emailing or texting her mom directly rather than going through my husband (he has been the ‘middle’ man for years). It all sounds so simple and obvious but like they say….it’s complicated. Blended families take a lot of work. You have to work harder to communicate and are communicating with more people. 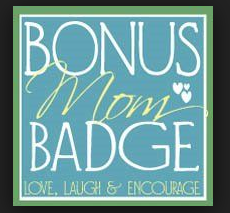 So kudos to all the bonus moms and dads out there! I know your struggle and you are doing great! I admire step families. It sounds like you’ve handled things extremely well. Thanks for reading! It can certainly be a test of one’s character. I think it helps to look at the big picture and realize that time moves faster than we like. What feels heavy today, is only a snap shot of our whole life. Learning to co-parent is SO HARD!! Yes, it is hard. It’s definitely not for the weak. 🙂 I find it easier when I set any judgements aside and solely focus on what my SD needs.